Writing career: Under the pseudonym Thorne Lee, he wrote about 50 stories from 1942 to 1951, almost all in the crime/detective genre. Two novels, "The Monster of Lazy Hook" and "Summer Shock", both reviewed at MysteryFile. 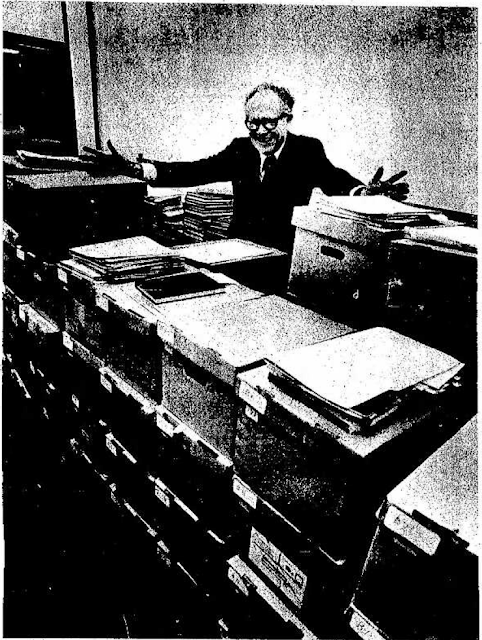 This article was originally published in the Hayward, California, Daily Review on February 16, 1975. Somewhere in Thornton Shively's expansive collection of notes and story outlines is the material for a best-selling novel. Of that, he's sure. An incorrigible optimist, Shively likes to fantasize that he will turn out a best seller one day, perhaps when he retires from California State University, Hayward, where he is a senior assistant librarian. "All writers have the fantasy of writing the great novel," Shively said. "I have the material in my notes to achieve that potential." The question, he acknowledges, is whether he has the writing ability. Shively, 62, of Fremont, has been a writer all his adult life, even though his livelihood has been various other jobs. He has worked for a florist in Hastings, Neb., to get him through Hastings College. He was a florist again in the late '30s when he moved with his brother and his brother's family to Los Angeles while the Depression was frustrating job seekers. "It was in the Beverly Hills Hotel. I saw a lot of movie stars passing through that hotel," Shively said. HE worked at another Southern California hotel to get him through graduate school, worked for the Southern California Gas Co. during World War 2, taught for awhile, and became a librarian. At Hastings College. Shively, wrote the script to "Uncle Sam Jr.,” a musical comedy with a measure of political satire. The theme of the play, Shively said, was war and peace on an international scale. One side in a conflict lays down its arms, accepting a peaceful solution to the war. The other follows suit. It was an idealistic play — but it was also 1933. Shively worked for a gas company during the war. writing as much as he could, knowing that the time would come when he'd strike out as a full-time writer. The Image of the writer then, as now, involves a Bohemian, not quite respectable lifestyle, he said. “Bohemian in the sense that it’s difficult to convince to people who aren't writers that you’re making a living at it. Society casts you in this light. Writing isn't quite a respectable profession, unless you write a best seller or become a name writer. Then you join the literary ranks.” Shively said. After the war, Shively moved his family to Ashland, Ore., in the search for a cheaper place to live, to enable him to write full time. He wrote for four years, publishing two novels, another novel published in serialized form, a large quantity of short stories and novelettes, all for the detective magazines of that late '40s era. Shively's first novel, under the pen name of Thorne Lee, had two characters which his readers were to see in a number of other mystery stories he wrote. The characters were a brainy wheelchair detective and his private-eye partner, the physical dimension of the team. "They weren’t based on anyone I knew, just what I thought would make an interesting detective team." he said “But they didn't achieve literary fame." Shively and a number of writers grew up in the era of the pulp magazines, some moving on to larger and more prestigious publications, others into the movies and the then-emerging and lucrative television. "The pulp magazine field was the most open one to writers," he said. "And of course they emphasized mysteries and Westerns and science fiction. I never tried much science fiction, though I sold a couple of stories." Television precipitated the collapse of the pulp magazine market in the late '40s, Shively, said, and those who couldn’t make the transition to television and movies had to turn to other things. Shively left Ashland for Visalia, where he taught English on a junior college level for several years, beginning in 1960. During his summers off, he wrote his second novel, "Summer Shock,” a mystery with the Ashland Shakespeare festival as its backdrop. It sold 2,000 to 3,000 copies, he said — not a major success. Shively left Visalia for the Bay Area, stopping in Berkeley long enough to receive a librarian’s degree from the University of California. Then it was back to Ashland, Shively said, for four years working in the Southern Oregon College library. The next stop in his seemingly restless trek was Guadalajara, Mexico, where he sought a reduced standard of living for another shot at being a full-time writer. It was to be home for a year, but his stay lasted only six months as the financial pressures closed in.
' The writing just wasn't paying off," Shively said. That's when I began looking in California and took this job at Cal State.” That was 12 years ago, Shively said, and he's remained at Cal State, looking at his retirement as another opportunity to write, this time without the usual financial pressures. The 12 years at Cal State haven’t been non-writing years, though, since he’s written two plays which were produced at Encino High School in Alameda. The first play, Shively said, was based on one of his mystery works, a novel which was serialized in 17 magazines, his first work to appear in ‘‘the slicks.” "Basically, my ideas seem to run in those lines — suspense. Don't know whether it’s that or because I wrote in that area for so long, but my best ideas always come out in suspense,” he said. He remains an optimistic and smiling person, though, and keeps his notes up-to-date, outlining his ideas for his future novels, any one of which could be that best seller.